The Rockland Shoji Lamp follows the tradition of using authentic Shoji Rice paper. The beautiful combination of Cherry with Walnut give it a unique look using these different woods. The lamp has three light level settings, a low setting that works as a night light, a medium level for general lighting and a full on for those occasions needing a large amount of illumination. All four sides provide a soft white light through the Shoji Paper. The lamp works well in the corner of a room reflecting light off the walls and ceiling giving off both direct and reflected soft light. The Shoji Paper is re-enforced with a polymer backer so it cannot be easily damaged. The Lattices with the Shoji Paper can be easily removed to access the bulbs. There are six Edison base sockets that can use standard bulbs providing up to 600 watts of equivalent illumination. LED (Light Emitting Diode) or CFL (Compact Fluorescent Lamps) are required to minimize heat. The lamp comes with a 10' cord so there should almost never be a need for an extension cord. All electrical components are UL/CSA approved. The lamp is shown with a Cherry frame and base and Walnut accents. The Rockland Shoji Table Lamp follows the tradition of using authentic Shoji Rice paper and is the smaller companion to the floor model. All four sides provide a soft white light through the Shoji Paper. The lamp has three light level settings, a low setting that works as a night light, a medium level for general lighting and a full on for those occasions needing a large amount of illumination. There are three candelabra sockets that can use either 25, 40 or 60 watt bulbs offering up to 180 watts of equivalent illumination. The table lamp should only use the new LED or Compact Fluorescent Lamps (CFL). 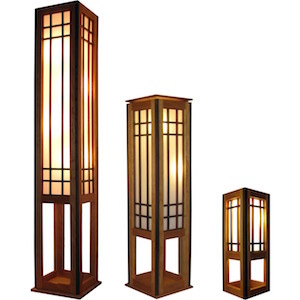 Additional Photos show the Rockland Shoji Family of lamps with a Cherry Frame and Walnut Corner and Lattice accents. Another Photo shows the 72" Shoji Lamp in a Birdseye Figured Maple frame with Cherry accents. Rockland Shoji Bulb Changing Instructions.